One of the 40 historic images of Queens that line the hallways of Executive Center. A display of historic images of Queens, obtained from the Queens Historical Society will be open to the public on Sunday, November 14, 2010, from 11:00 a.m. to 2:00 p.m. at the Executive Office Center at Fresh Meadows. The images, which depict life in Queens from the late 19th century through the 20th century, illustrate dramatically how the borough of Queens – and of course, life itself – has changed over the course of the past one hundred years. An image of the quaint wooden structure of the Flushing Post Office, from 1895, is remarkable in its disparity from the hectic service center it is today. Similarly, the Queens Library of today bears little resemblance to an image of the institution in 1905. Queens Borough President Helen Marshall, would no doubt be amused by a photograph showing a parade in 1902 for the election of Joseph Cassidy for Queens Borough President. Few people may recall that the a NYC building in Flushing Meadows Park was the temporary headquarters of the United Nations from 1946 to 1951, before it moved to its present location on the east side of Manhattan. The conference room of the Executive Office Center is graced by an image of the United Nations General Assembly voting the state of Israel into existence in 1948. A photographic retrospective of Queens would not be complete without pictures of the Worlds Fair in Flushing Meadow Park. 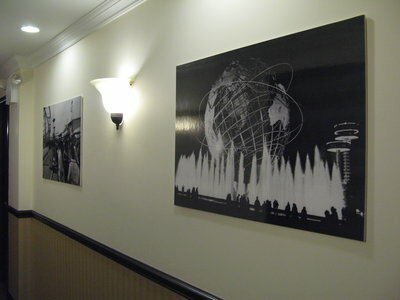 There are images in the hallway outside the conference room showing the opening and closing days of the 1964 Worlds Fair. For further information about the gallery event, contact Executive Office Center Associate Director, Mary Abrams, at 718-475-2121. The office building is accessible by the Q-17 bus, which stops nearby at the intersection of Horace Harding and 188th Street, and by the Q-30 and Q-31 buses, which stop at Utopia Parkway and 64th Ave.